Status: Rare casual spring migrant west. Rare regular fall migrant west and central. Documentation: Photographs, measurements: 31 Aug 2000 Oliver Res (Dinsmore 2000; Dinsmore and Silcock 2001). Spring: Recent reports suggest this species may be a regular spring migrant in the western Panhandle; it breeds fairly commonly as a disjunct population in the Black Hills of South Dakota (Tallman et al 2002, Drilling et al 2018). The two Jun records cited below suggest breeding might not be unexpected on the Pine Ridge. 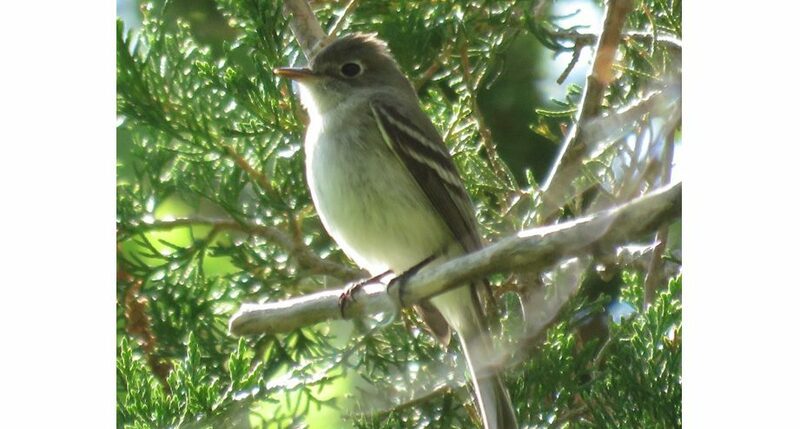 8 Jun 2015 between East and West Ash Creeks, Dawes Co (Birek, eBird, https://ebird.org/view/checklist/S39525955). 15 Jun 2013 Carter Canyon, Scotts Bluff Co (Brogie 2014). Mist-netting during the fall of 2000 provided the first tangible evidence that this species is a regular migrant in the Panhandle. Singles were captured, measured, and photographed at Oliver Reservoir 31 Aug, 7 Sep, and 20 Sep (Dinsmore 2000, Dinsmore and Silcock 2001, Jorgensen 2002). During the same fall there were three additional sight records: one “probable” at Oliver Reservoir 2-3 Sep, one at Mud Springs, Morrill Co 11 Sep (Jorgensen 2002), and one at Wind Springs Ranch, Sioux Co 20 Sep (Jorgensen 2002). A Hatch Year bird was banded and photographed at Chadron SP 24 Sep 2013 (Brogie 2014), and another was banded, measured, and photographed there 10 Sep 2014 (Brogie 2015). One was netted at Oliver Reservoir 24 Aug 2001 and another at Wind Springs Ranch, Sioux Co 25 Aug 2001. Comments: Out of a total of 138 Dusky Flycatchers banded at Barr Lake, Colorado, only three were banded in spring, 18-20 May, and the remaining 135 in fall, 15 Aug-10 Oct, including only eight adults (latest 26 Sep; Andrews et al 2002 ). As many as 55% of fall Empidonax flycatchers banded at Barr Lake in eastern Colorado were Dusky Flycatchers (Tony Leukering, personal communication). Photograph (top) of a Dusky Flycatcher at Rock Creek SRA, Dundy Co 13 May 2017 by Michael Willison. Andrews, R., R. Righter, M. Carter, T. Leukering, and A. Banks. 2002. Birds of Barr Lake and Surrounding Areas 1888 through 1999. Ornithological Monograph No. 1. Rocky Mountain Bird Observatory, Brighton, Colorado, USA. Dinsmore, S.J. 2000. Mist netting at Oliver State Recreation Area. NBR 68: 177-179. Drilling, N.E., E.D Stukel, R.A. Sparks, and B.J. Woiderski. 2018. The Second Atlas of Breeding Birds of South Dakota. SDGFP, Wildlife Division Report 2017-02. South Dakota Game, Fish, and Parks, Pierre. Silcock, W.R. 2001. Spring Field Report, March to May 2001. NBR 69: 46-79. Silcock, W.R. 2004. Spring Field Report, March-May 2004. NBR 72: 38-58. Silcock, W.R. 2008. Spring Field Report, Mar-May 2008. NBR 76: 50-71. Silcock, W.R. 2017. Spring Field report, March-May 2017. NBR 85: 54-83. Willison, M. 2016. Checklist S31517813: Pine Bluffs–exit 1, Kimball County, Nebraska, US. eBird.org, accessed 4 Jun 2018. Willison, M. 2017a. Checklist S36824534: Rock Creek SRA, Dundy County, Nebraska, US. eBird.org, accessed 4 Jun 2018. Willison, M. 2017b. Checklist S36896453: Oliver Reservoir SRA, Kimball County, Nebraska, US. eBird.org, accessed 4 Jun 2018.